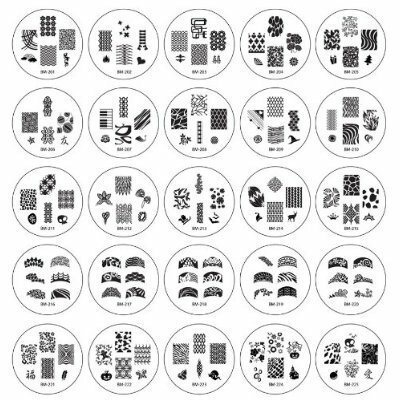 Recently Bundle Monster released a set of 25 new plates, with all new designs including full nail images, small images and tip images. There is quite a wide variety of designs, which I really love, including some holiday designs, abstracts, flowers, and more. They work really well, and I have no complaints about ease of use or application of any of these stamp designs that I have tried so far. 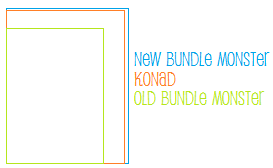 But the real question is, how do these new plates stack up to Konad and the original BM set? There were a few things I had issues with on the first plates (even though I still love them!) and I was thrilled to see they were fixed! The first issue I had was the size of the full nail images. The original BM plate images were rather small, and the only nail I could ever reliably cover was my pinkie, leaving me to either try double stamping or just live with the space. However, the new plates have bigger images. Not only are they bigger than the original BM images, they are also (slightly) bigger than Konad images! My other big complaint with the original plates was that there was no backing on the back of the plates and the edges were a little rough. They have also solved that - there is now a paper backing (similar to Konad plates) and they edges are smooth and perfect. All in all I was incredibly pleased with this new set and I highly recommend it! Bundle monster plates can be purchased from Amazon or the Bundle Monster Website for $21.99. If you enjoy nail stamping at all, I highly recommend getting yourself a set! Can't wait to make an order! Good price! I really like the fab designs and nail polish colors.